Symmetry is often a really nice thing. I like snowflakes as much as anyone. So long as no more than three gather at any one time. And, I suppose that making a building with four identical sides probably saves marginally on costs. Maybe. But if you really care about the “customer experience” wouldn’t it be nice if the customer can figure out how to enter your building? I mean, enter it without walking the perimeter a few times. Especially if it is raining, or sleeting, or boiling hot, or dark. There is a variant on this which is popular with convention centers. They are required by law I guess to have approximately 480 doors or more. However, typically, all but one or two of these are locked. Perhaps an argument could be made that making the entrance to a building difficult to detect adds to security. I seriously doubt it. A determined burglar could find out by trial and error or observation where the door is. That burglar has plenty of time because you see, being a burglar is how they make their living. But not so your customer. Much as you would love to *think* that your customer has nothing better to do than circle your establishment trying to find a way in, they do, in reality, have better things to do. Recently, I had occasion to visit Paris. Do you have any trouble finding the doors in the building shown? 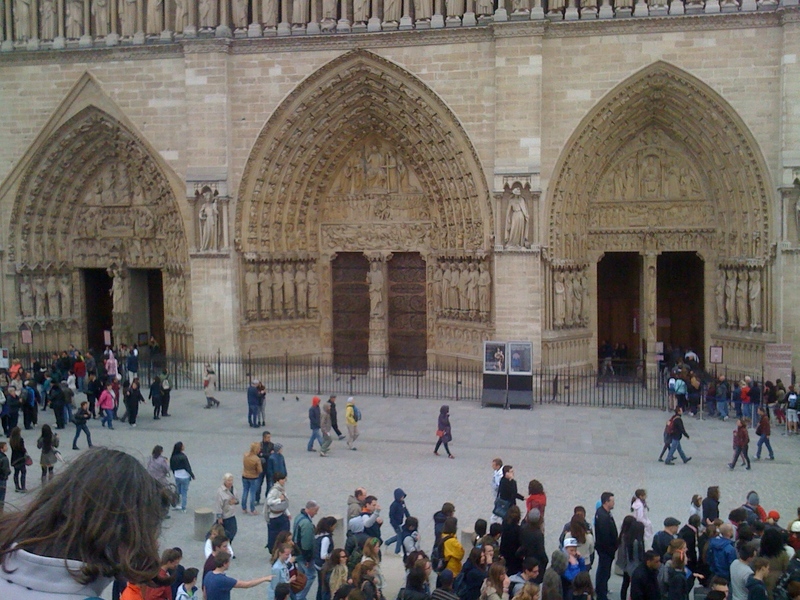 Last year was the 850th birthday for Notre Dame. So, having an entrance which is distinctly visible from a distance as an entrance, we would have to say is a *solved problem*, n’est pas? Check out Pattern 110, Main Entrance, in Christopher Alexander’s A Pattern Language.